Uh oh! What an spectacular month dear Sammy had this last March. Seems like April is breaking that aura of everything-happy-and-cool as we are already looking at one of the bad news surrounding industry’s darling Galaxy S6 edge. Latest test reveals that just like iPhone 6 Plus, Samsung’s Galaxy S6 edge is also prone to bending, and worse. Samsung Galaxy S6 edge bend… gate? This sad news comes from SquareTrade which is a company offering smartphone insurance plans. Naturally, this company is interested to know how durable these expensive smartphones actually are. 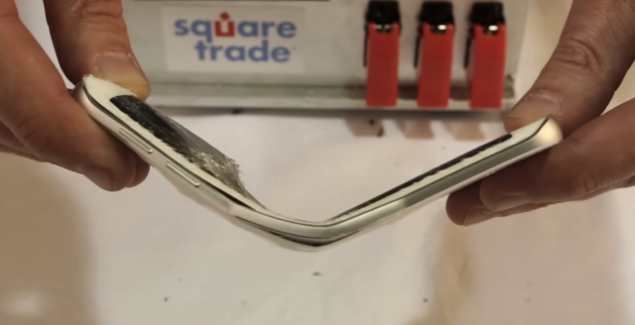 SquareTrade posted the results of its internal testing of Samsung Galaxy S6 edge showing that the device bends as easily as the iPhone 6 Plus. For comparison, SquareTrade tested iPhone 6 Plus and the HTC One M9 as well. The video of this test shows that both the Galaxy S6 edge and the iPhone 6 Plus take in about 110 pounds of pressure before giving up and bending. However, the worse thing is that 6 Plys only shows a bent chasis, while the Galaxy S6 edge ends up having a cracked display. Nasty issue to have sorted. HTC One M9 can take up 120 pounds before bending. The video further shows that to render iPhone 6 Plus completely useless, it takes about 179 pounds. On the other hand, S6 edge gets completely shattered at 149 pounds which makes the device worse than the bendgate infamous 6 Plus. We have seen quite a few drop, water, and scratch tests of Samsung Galaxy S6 edge showing how durable the phone is. However, seems like the durability meter goes down a bit when it comes to bending. We will, however, wait for user complaints – as we saw many in the iPhone 6 Plus bendgate issue – before claiming that the device will actually bend in the normal usage pattern too.